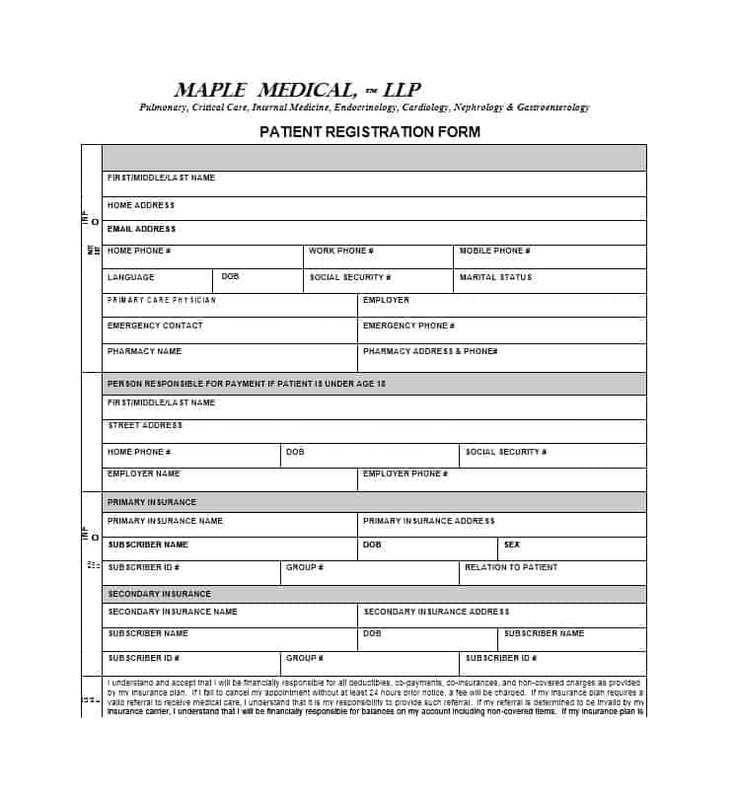 When it comes to medical forms, a form that you simply cannot afford to ignore is a patient registration form. After all, you need patient registration form to get admitted to a hospital. 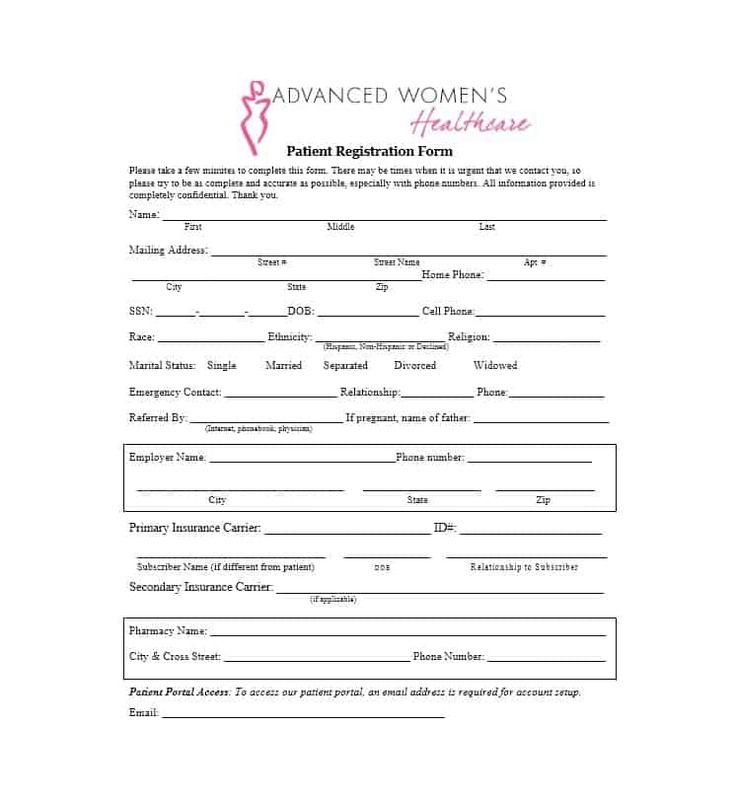 Patient registration form is the first form that you’ll need and all other forms come after it. 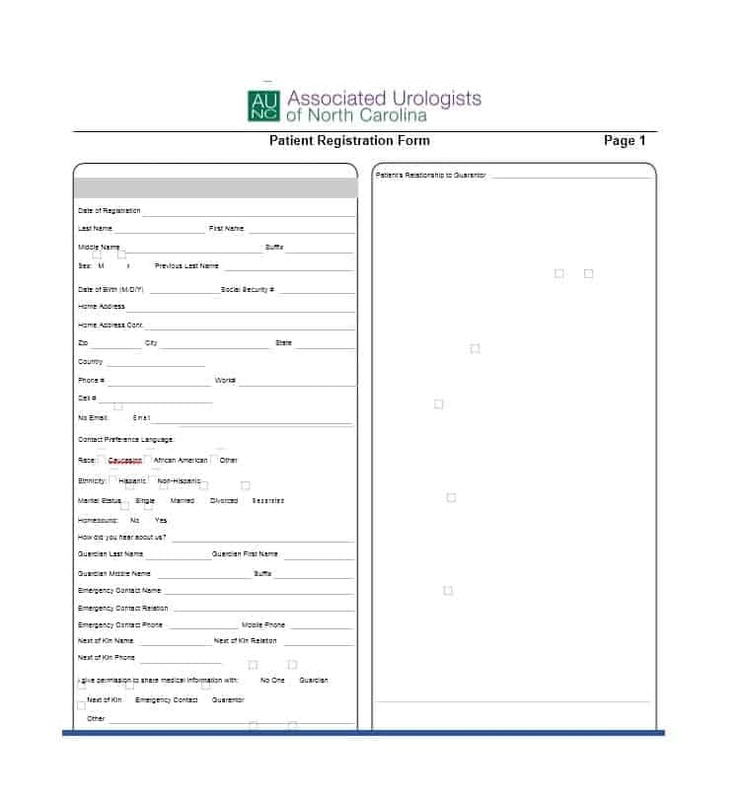 So, what is a patient registration form and what does it include? Let’s find out. 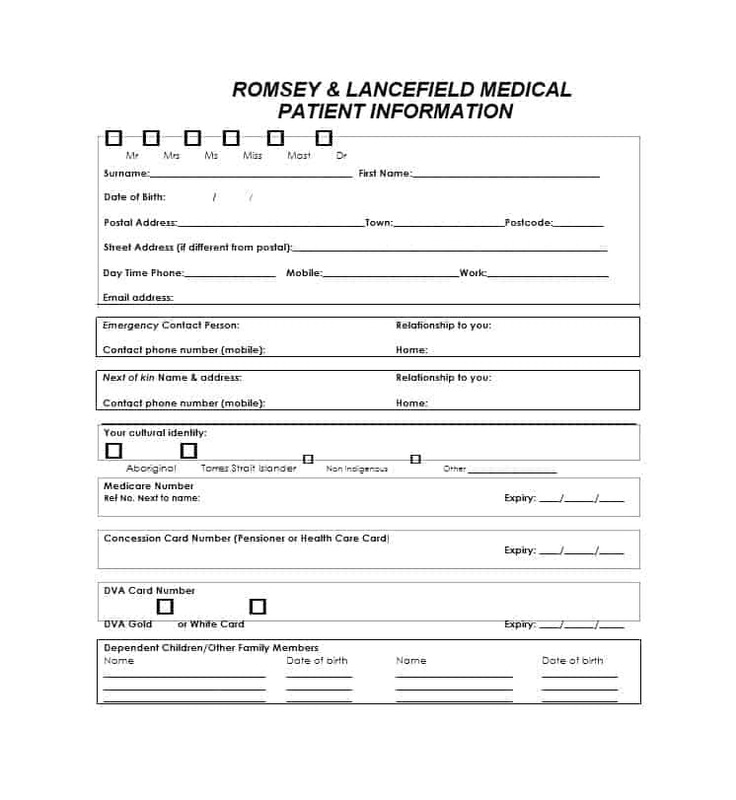 One of the most common medical forms, a patient registration form is used for two different purposes. 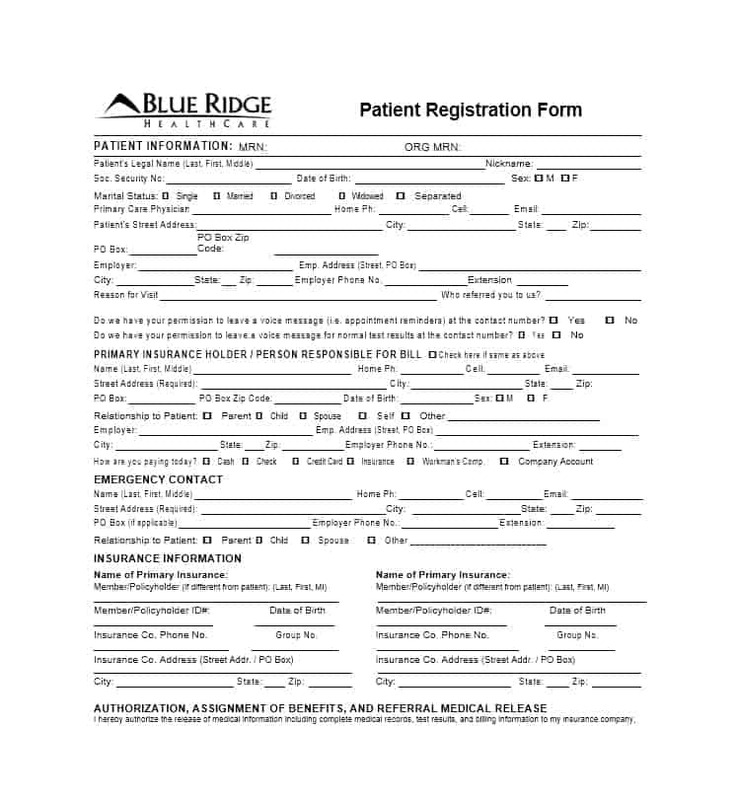 The first purpose or reason to use a registration form is collecting information related to new patients to generate a new patient record. 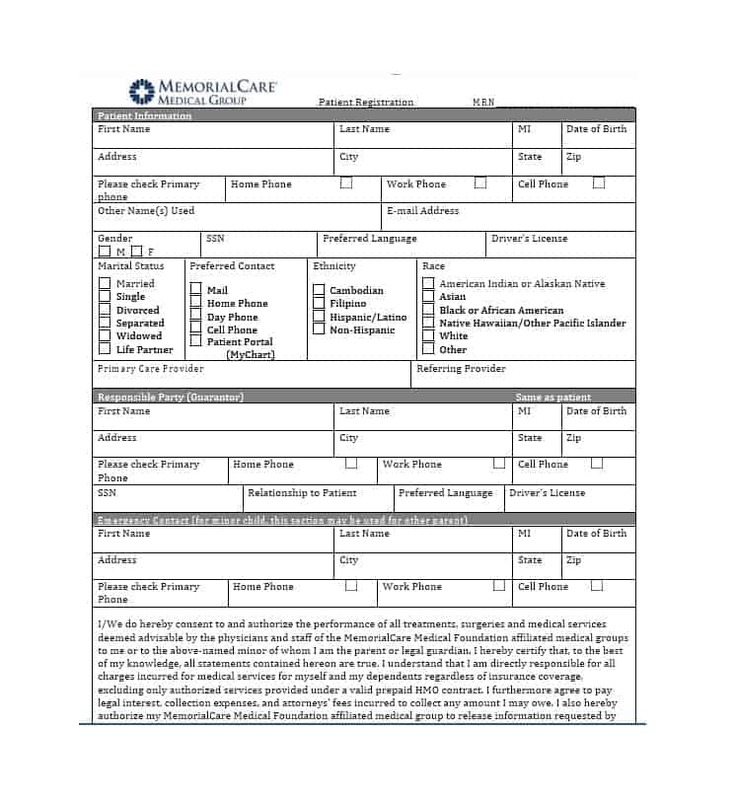 The other reason to use the aforementioned form is collecting the information required to help the computer perform accurately and safely in a computer-assisted surgery. 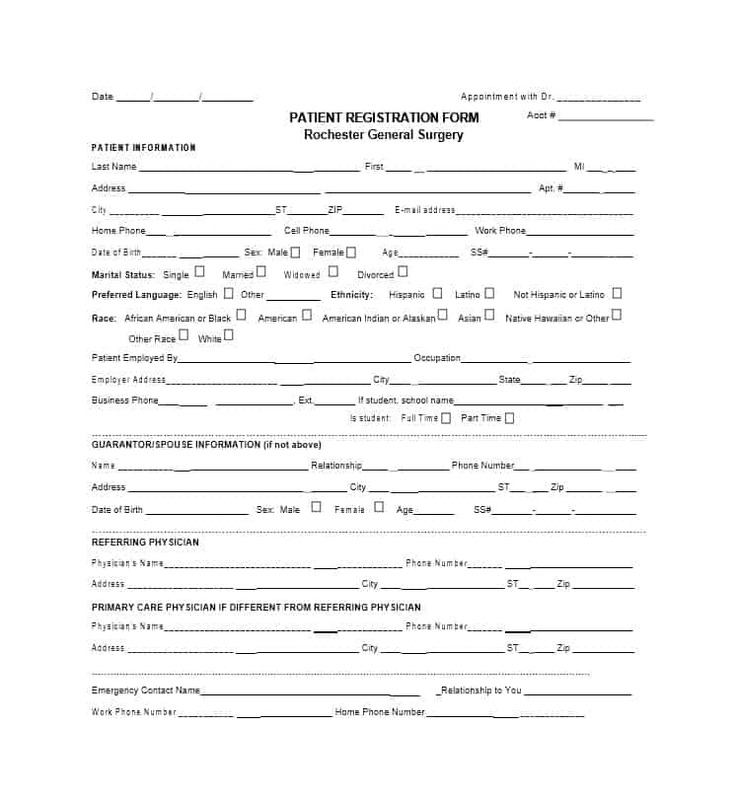 As soon as a patient enters a new hospital or clinic, he or she is required to fill out a patient registration form. 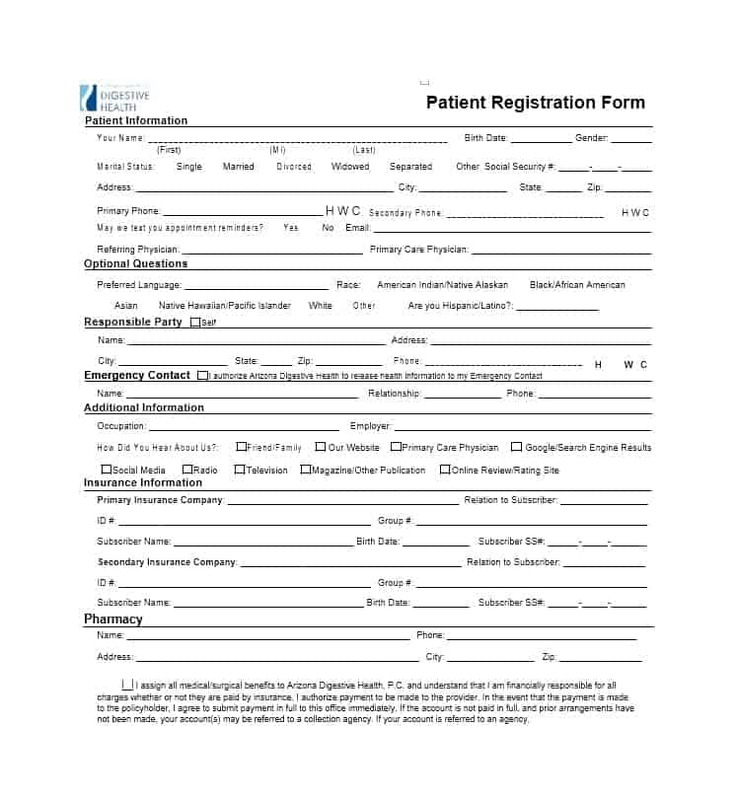 Generally, filling out a registration form that provides basic information about the patient and his/her medical history is mandatory for patients. 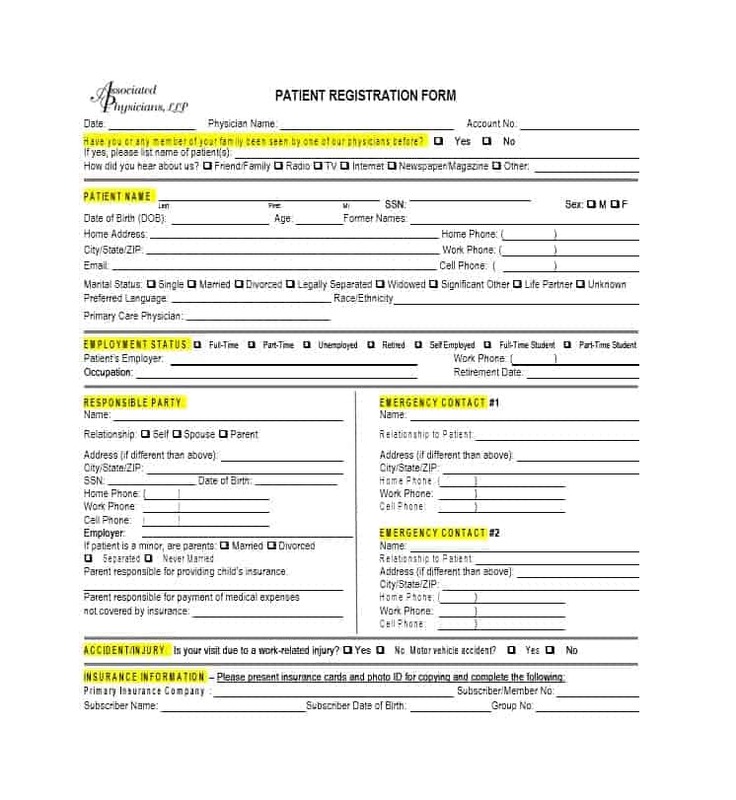 Some of the information provided by patients in the registration form includes the patient’s contact information, name/details of the patient responsible for payment and payment guarantees. 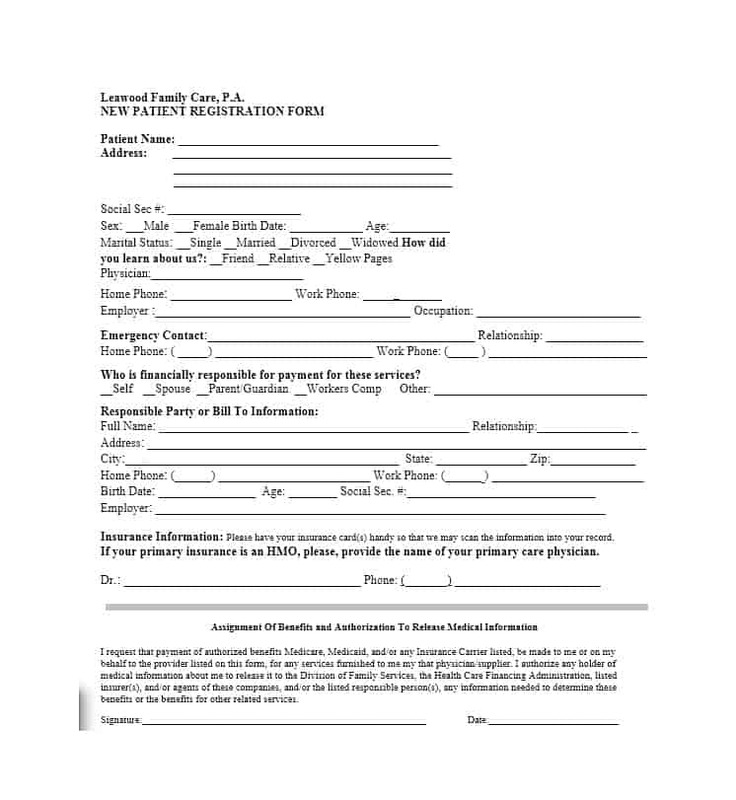 In addition to the above, the registration form may include information related to insurance billing, provided the patient’s insurance covers healthcare expenses. 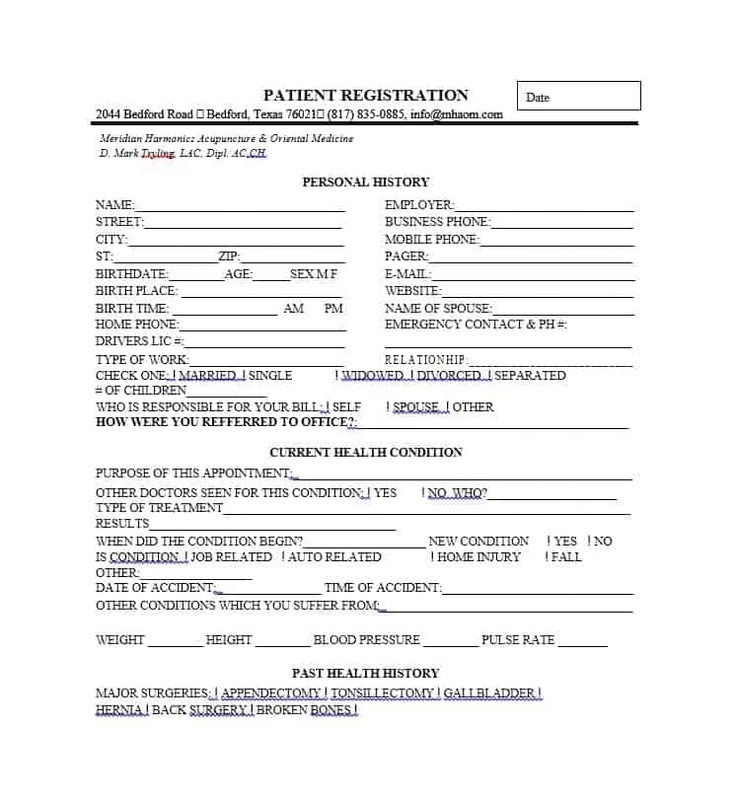 Before we further discuss the patient registration/patient information form, let’s take a look at why patient registration is important. For hospitals, the revenue cycle begins with the patient registration. For patients, patient registration is the first step in the treatment of their condition/disease. 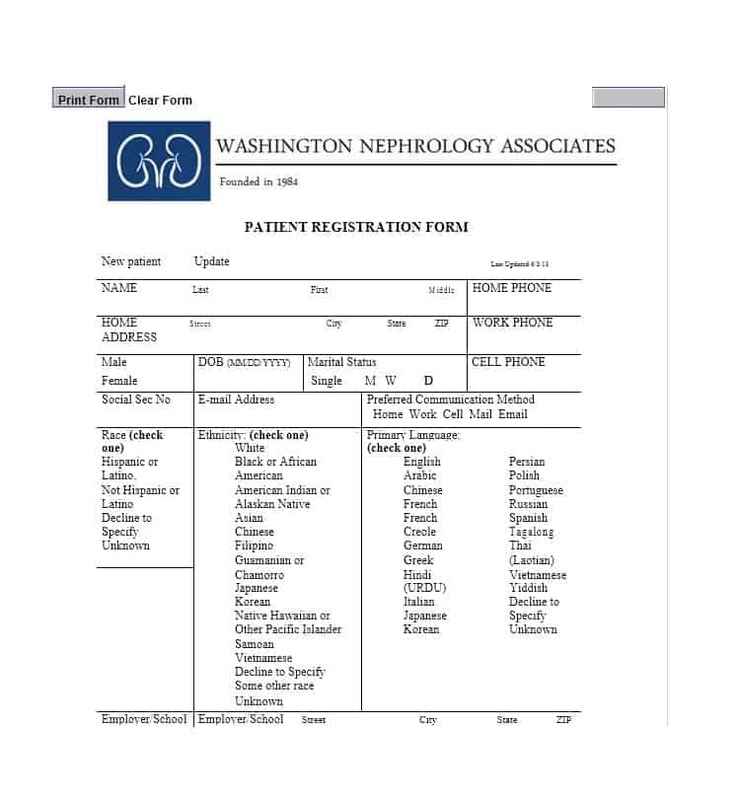 This is why it’s important to ensure that the information provided in the new patient registration form is correct and complete. The next steps in the health care process will ultimately fail if anything is omitted in the form of if the patient provides incorrect information. In short, performing patient registration appropriately is the first step in successfully treating/ taking care of the patient. To ensure that all necessary information is gathered at the time of the registration, hospitals/clinics should use a script or checklist. 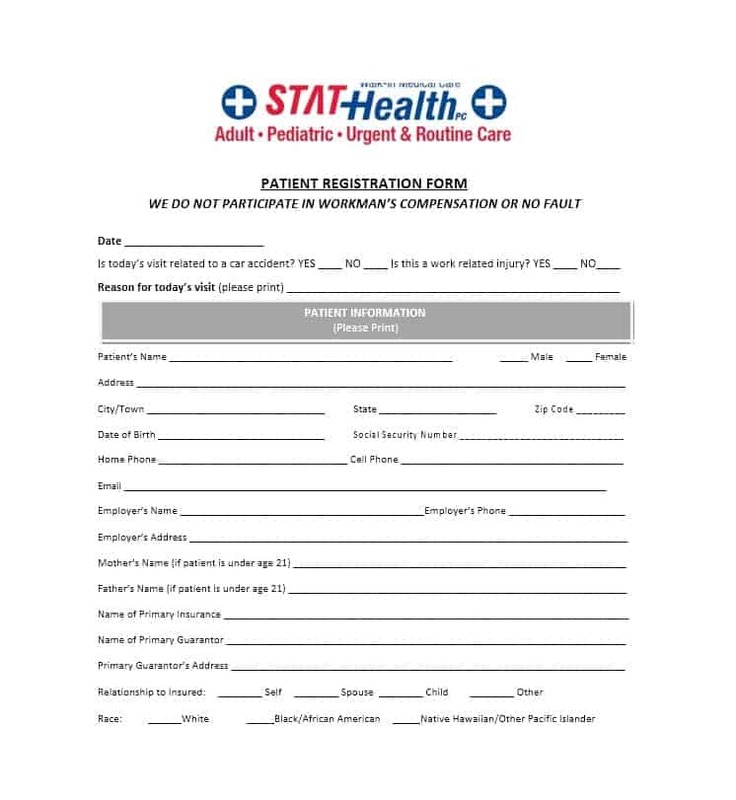 It is extremely important for the front desk to know what information must be provided in the patient information form by the new patient. 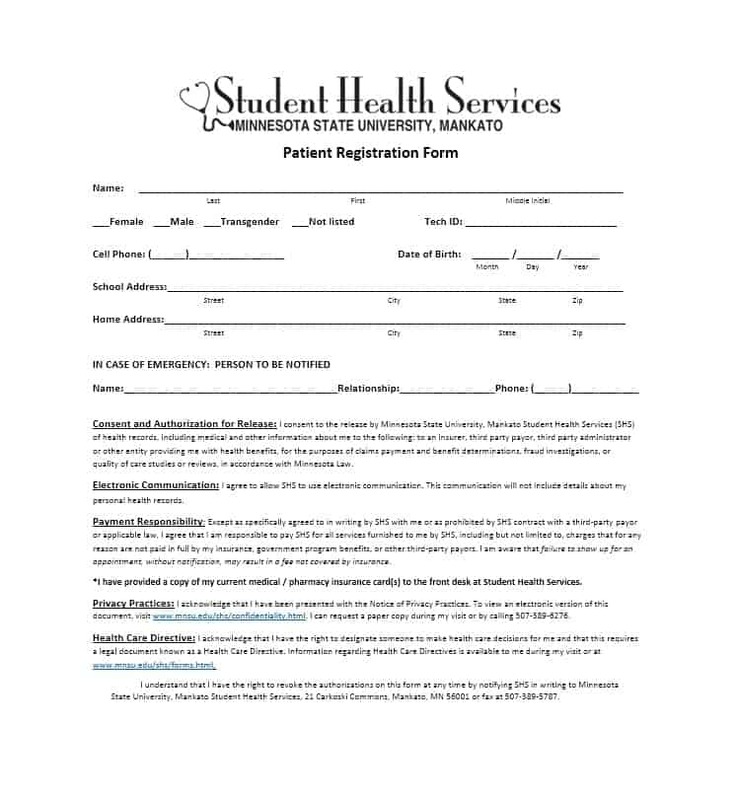 The front desk will be able to help the new patient fill the registration form appropriately only if they themselves know what information must be provided in the form. 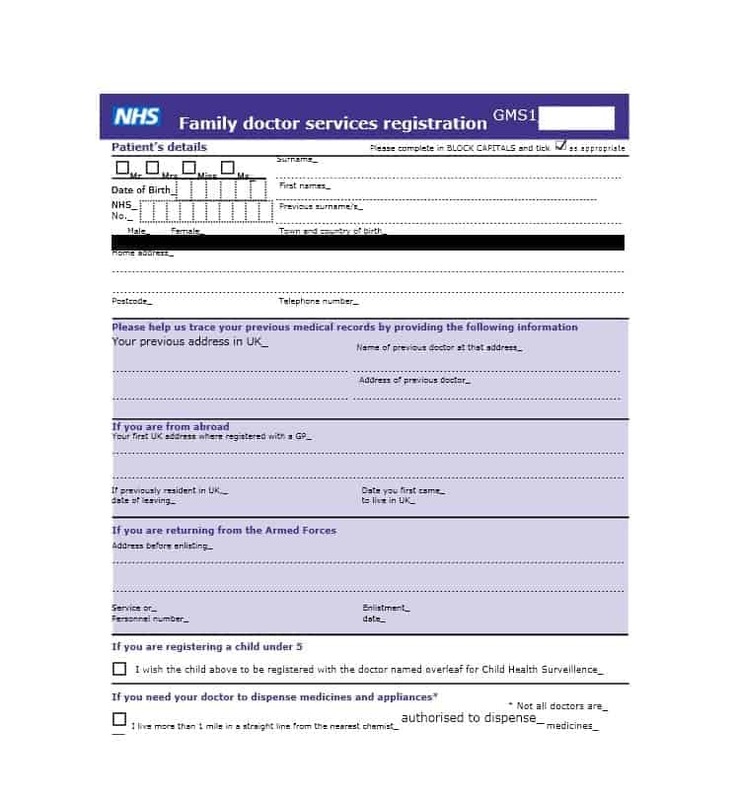 A good way to find out what information must be included in a new patient registration form, take a look at a patient information form template. In addition to the above, the front desk must be able to explain to the new patient what information he/she has to bring to the appointment, when the payment is due and whether certain paperwork needs to provided. For most people, patient registration is a headache. 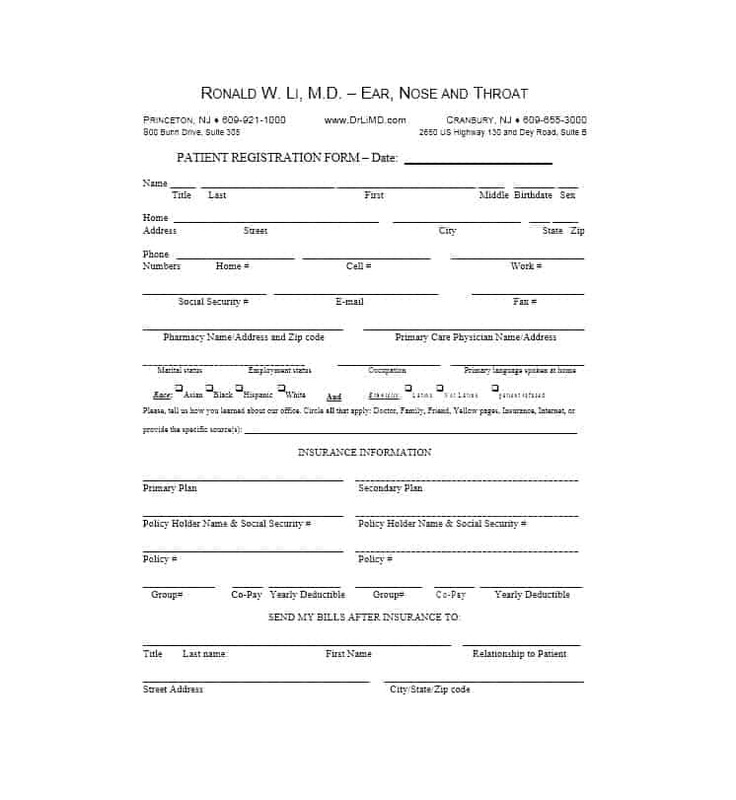 Generally, the people who fill out the form are either too sick to fill out the form or are caretakers of the patient who have their minds elsewhere. 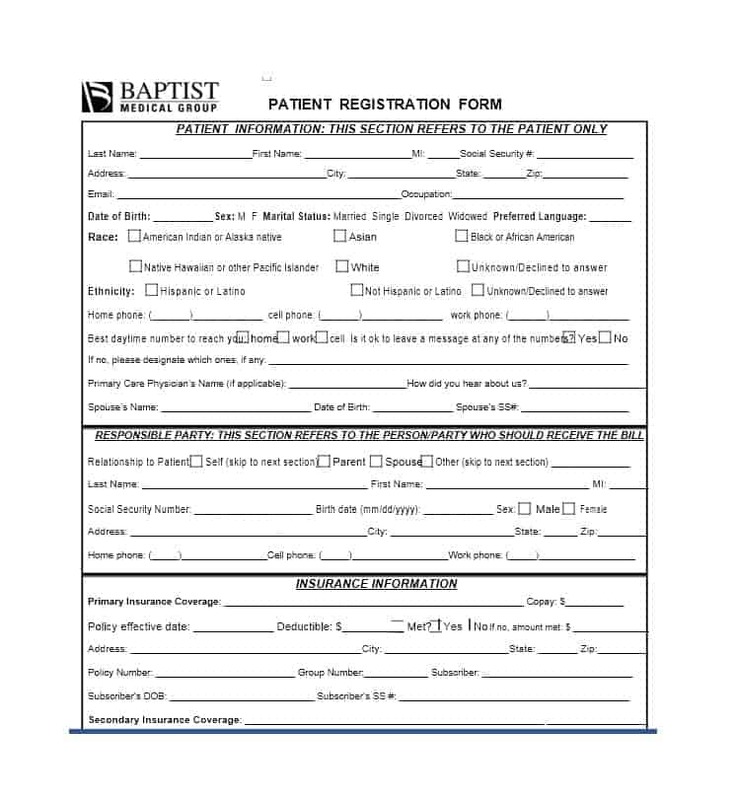 When completing a patient registration form, it’s very common for people to get frustrated or skip things. It is important for hospitals/ clinics to understand that the main purpose of patient registration forms is making the billing process seamless. During the registration process, the majority of the information is provided by the patient or his/her guardian. The entire patient care process will be affected if any information is omitted or if the information provided is incorrect. Apart from ensuring that the information provided is correct and complete, the hospital administration should go through the registration form to find things that they may find difficult to interpret. 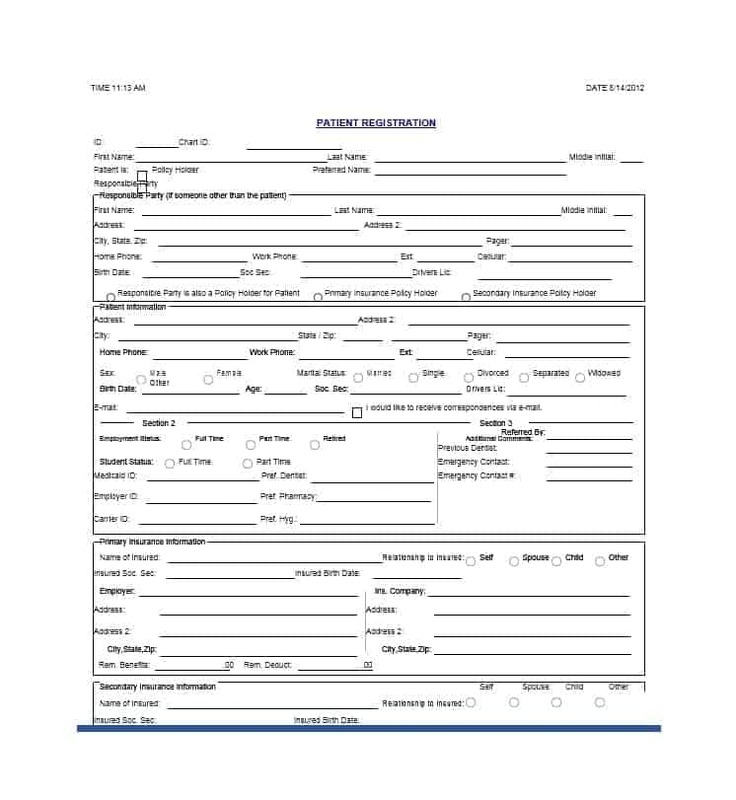 Once the administration knows about these things, they can put forth this part of the form to the patients in the simplest of manners so that the patients can provide them the relevant information which is easy for the hospital administration to understand. By doing so, the hospital administration will ensure that the most the information provided in the form is accurate. In addition to the above, it is important for the hospital admin to ensure that the copies of the documents provided by the patient are true copies of the documents. This will make things easy for the hospital in case anything needs to be verified in the future. Most of the times error occurs in the registration process because of the difficulty/complexity of the process. This means that there is either ‘too much’ information on the form for the patient to deal with or the terminology on the form is difficult for the average man/woman to interpret. 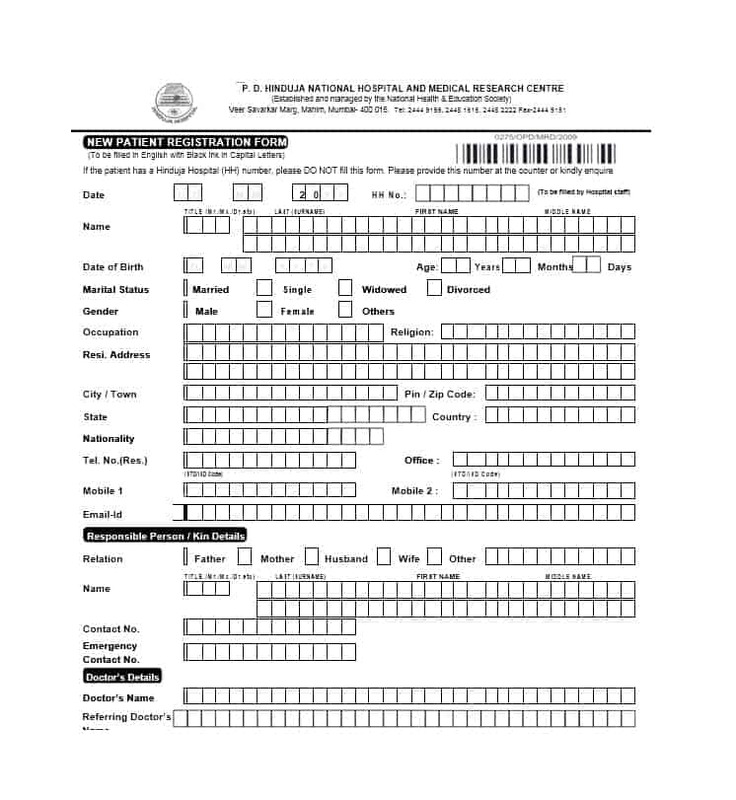 For the above-mentioned reasons, it is important for hospital to draft a patient registration form that isn’t too lengthy and uses easy terminologies which the average man/woman can understand. 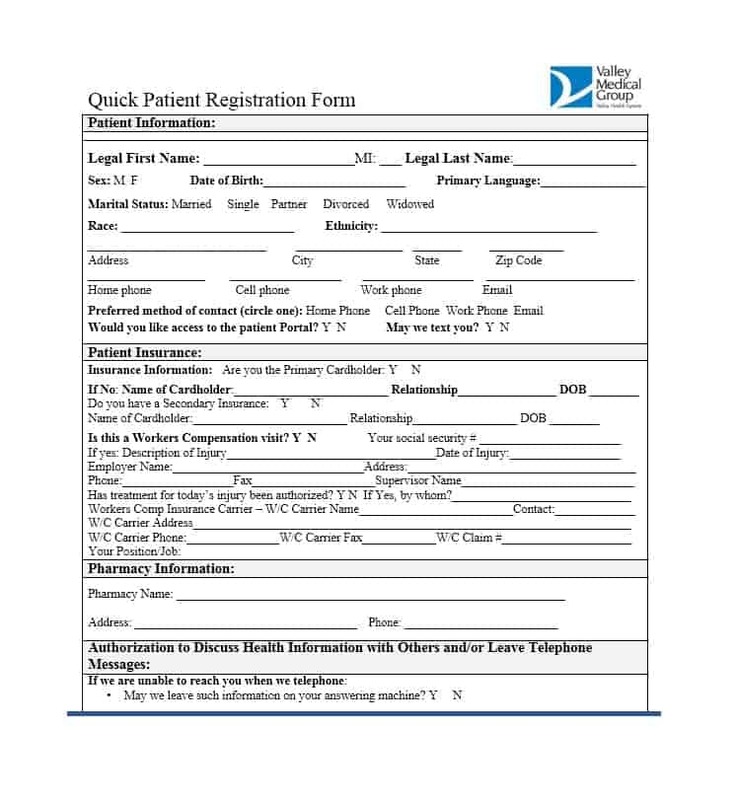 You can get a better idea of this by taking a look at a patient information form template. To make things easy for themselves, many hospitals are using registration software. While registration software can make the registration process less tiring, its lack of security and vulnerability to crashes makes it an unviable solution. 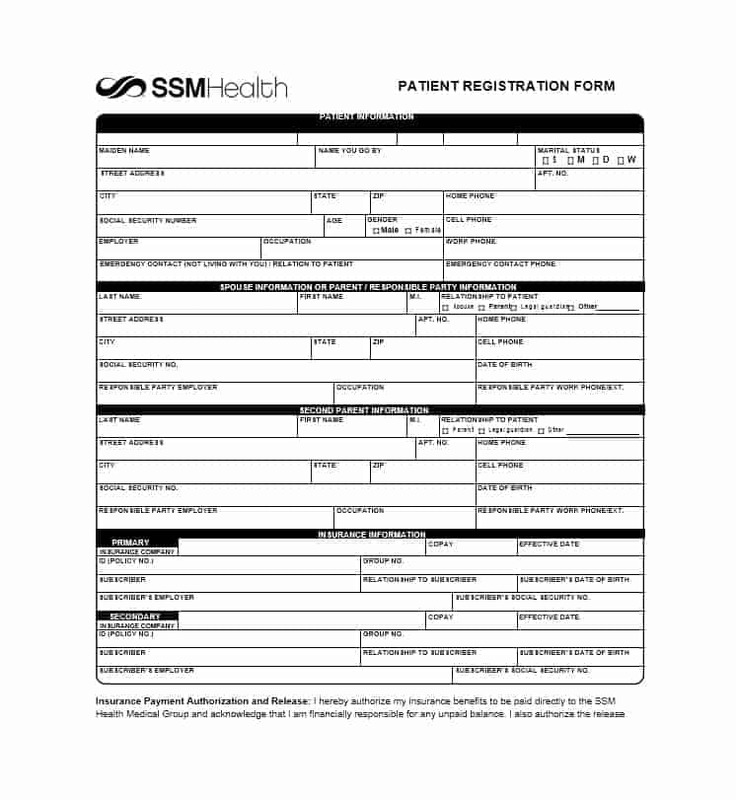 The best thing that hospitals/ other medical care providers can do to ensure a seamless registration process is drafting a patient information form that is easy for the patient/other person filling out the form to understand. Moreover, the form should not be too lengthy. By doing the aforementioned things, hospitals will ensure a successful registration process which in turn will allow them to take good care of the patient. Considering the aforementioned information, we can say without hesitation that patient registration is the most important step in successfully treating/ taking care of the patient. The most important part of the registration process is the new patient registration form which we will be discussing in detail next. 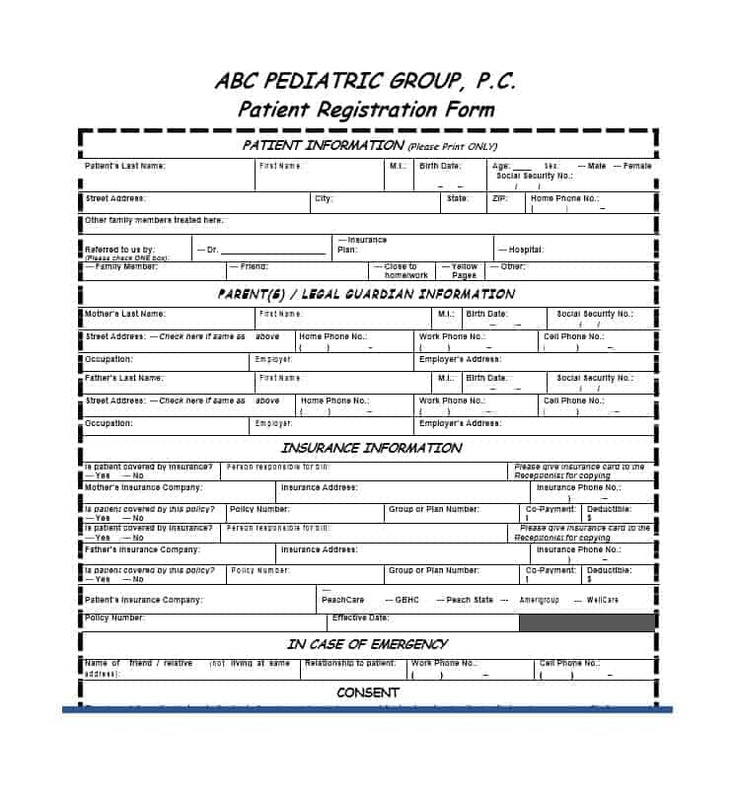 Patient registration refers to two things in the medical field. The first thing that patient registration applies to in the medical field is the collection of the data related to new patients to generate a new patient record. The other use of the term patient registration in the medical field is for the collection of the information used in computer-assisted surgery. 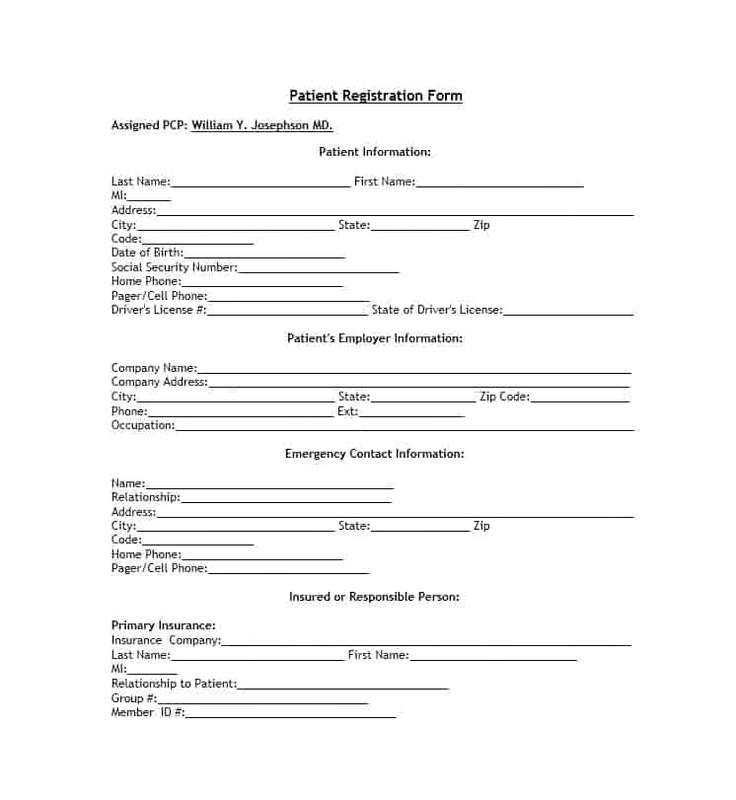 Regardless of what it’s used for, a patient registration form will include the same basic things. 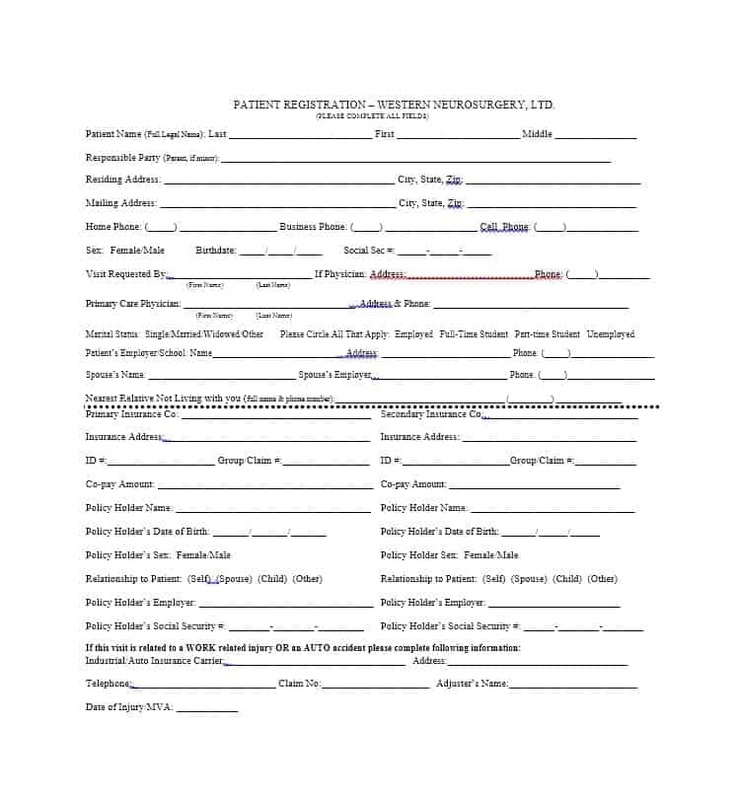 The patient registration form is a document that patient can use to reveal important medical information about them. 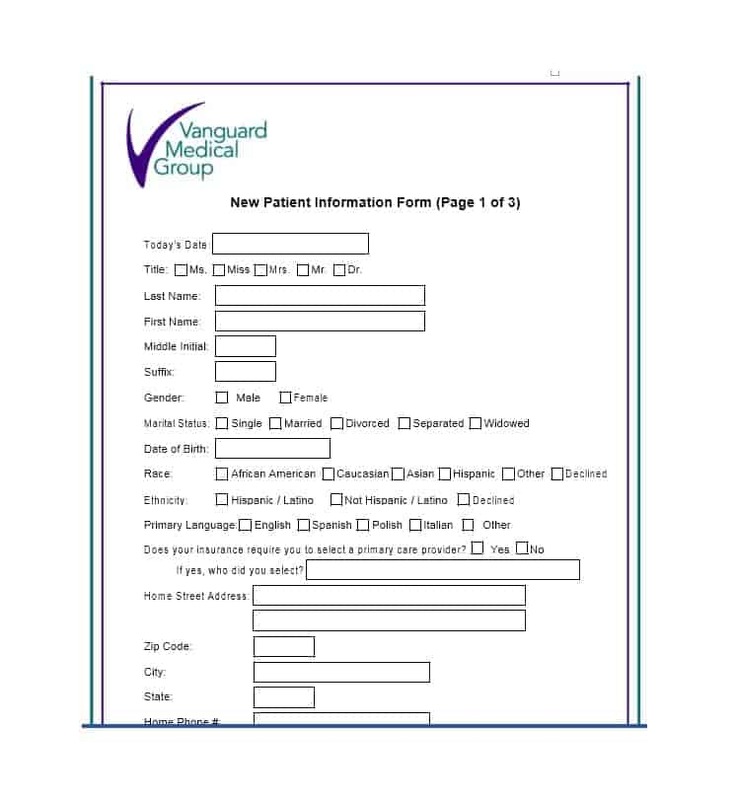 Talking about revealing important medical information to another party, patients can sign a medical release form to allow hospitals and other medical service providers to release confidential patient information to a third party. 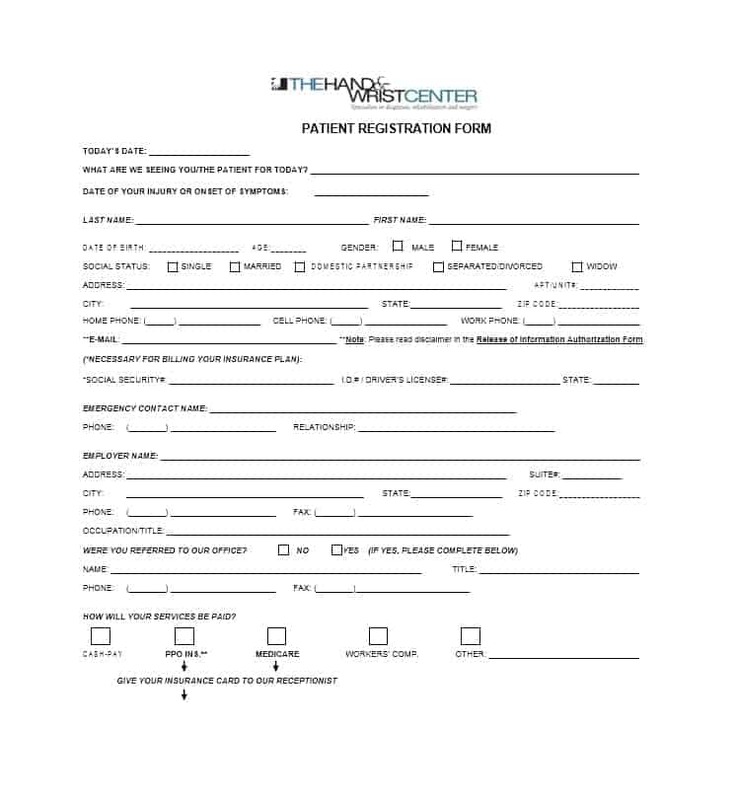 Coming back to the subject at hand, patients are asked to fill out a patient information form immediately after they enter a new hospital, clinic, or other treatment center. 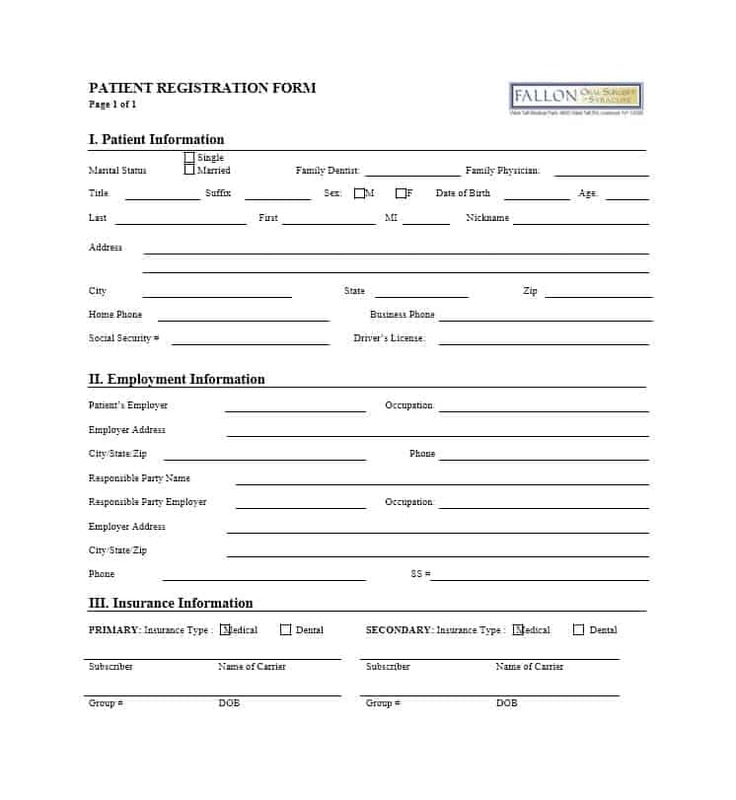 A form that new patients must complete, a patient registration form is used to gather basic information about the patients and their medical history. 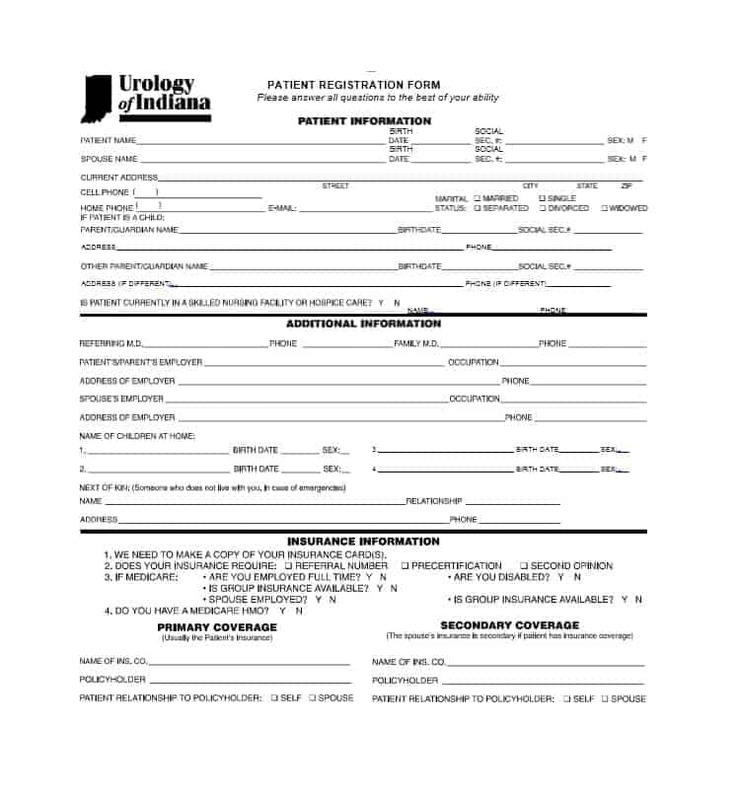 Information that patients must provide in the registration form includes the patient contact information, payment guarantees, and information about the person responsible for payment. Also, if the patient’s insurance covers health care expenses then the information related to the insurance provider must also be provided. It is important for patients to ensure that they have the aforementioned information with them when they visit a hospital/ medical care center for patient registration. Also, if the physician asks for any information other than the ones mentioned above, patients must bring that too. Also, if the spouse of the patient also works and has coverage then the patient must inform the hospital about it. The hospital will then decide on its own which insurance should be primary. Providing insurance coverage information is important for most patients to complete patient registration. However, this is just one aspect of the patient registration process. Other important things to ensure during the registration process include providing complete and accurate information in the registration form. 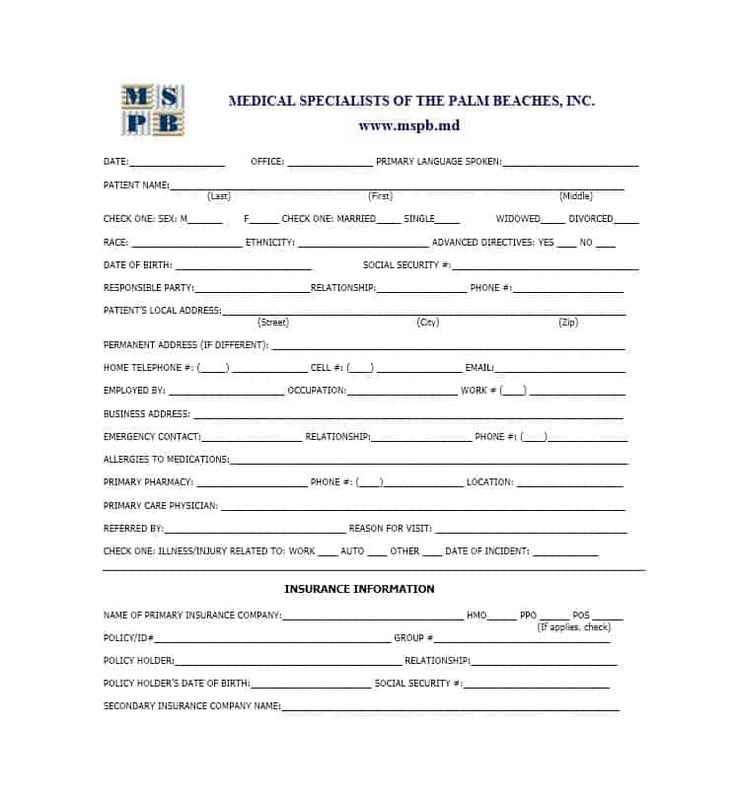 Also, if required, you must provide details of your health conditions, medications, or insurance coverage. 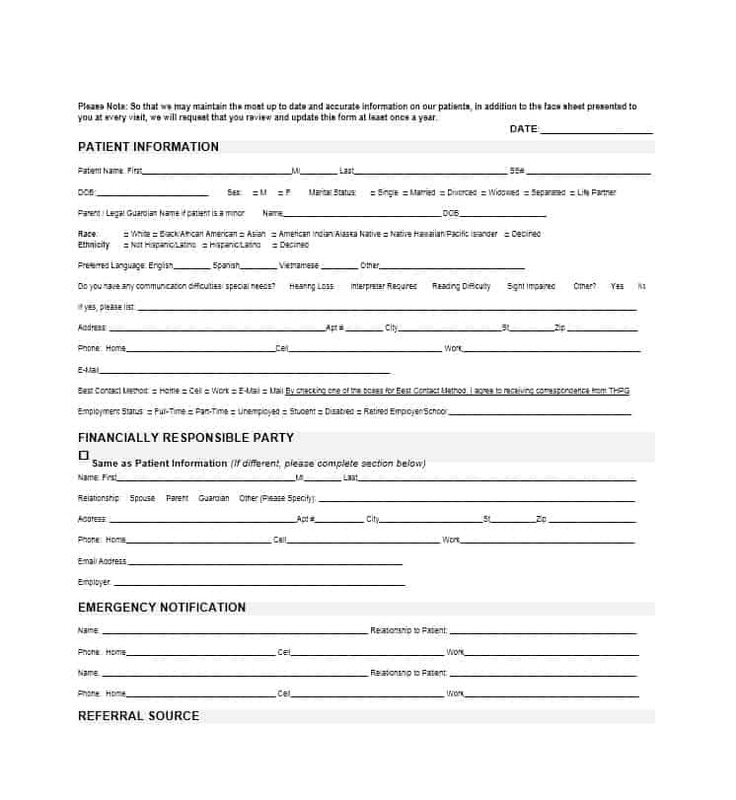 In case a patient suffers an emergency and isn’t able to complete the patient information form himself, a friend or family member of the patient can fill the form for the patient and after the patient gains consciousness, he/she can verify the information and approve it. Also, the hospital/ medical care center is allowed to temporarily set up registration in case the patient has no one with him at the time of admission. Talking about getting help in an emergency, you can ensure that you are taken care of in an emergency by completing and signing an emergency contact form. 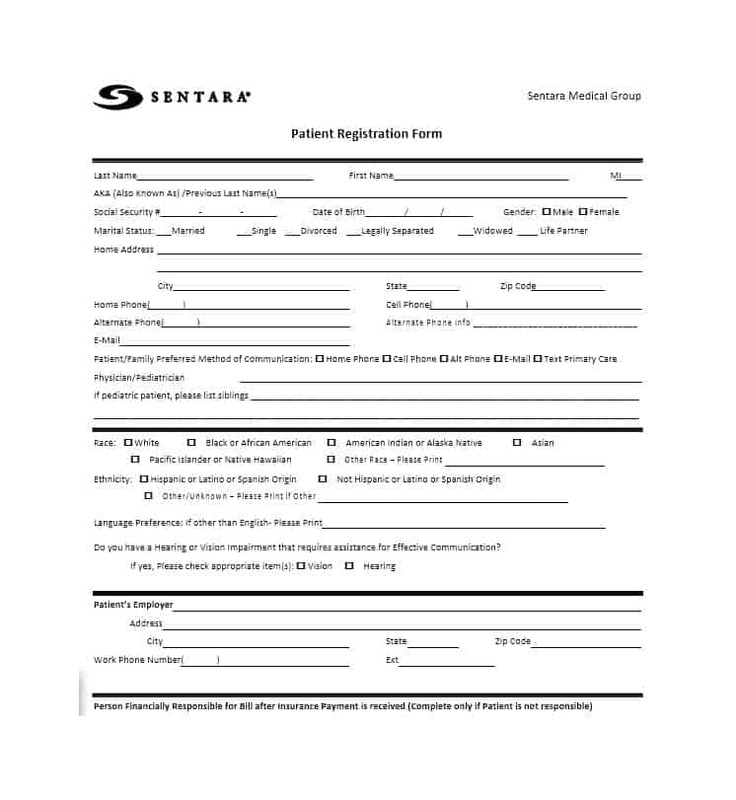 To make thing easy for patients, many hospitals/clinics allow patients to fill the form online. 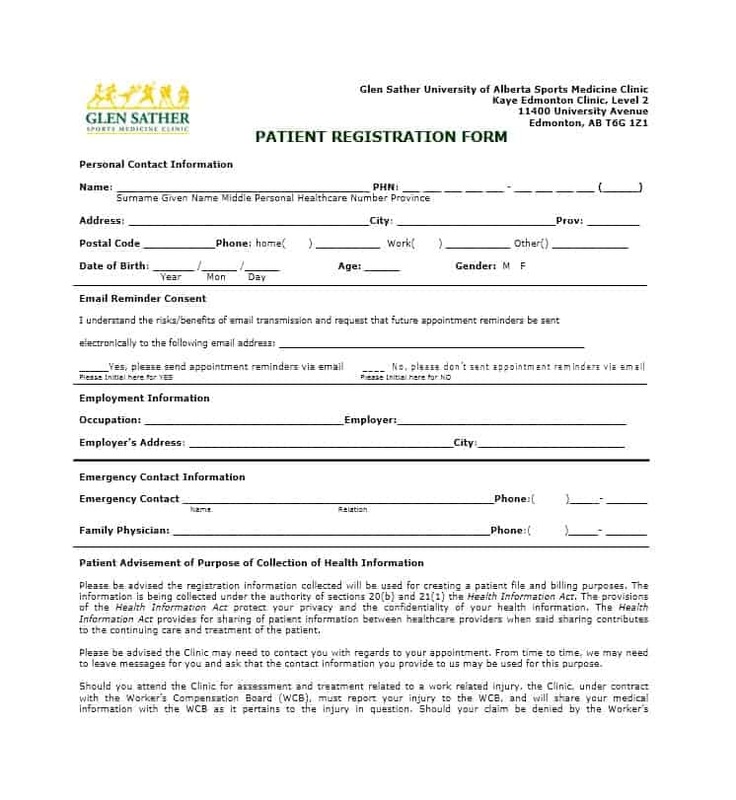 This ensures that the only thing that patients need to do when they arrive at the hospital is sign the printed copy of their new patient registration form. Regardless of how they collect the patient information, patient registration can help hospitals/clinics to take better care of patients. 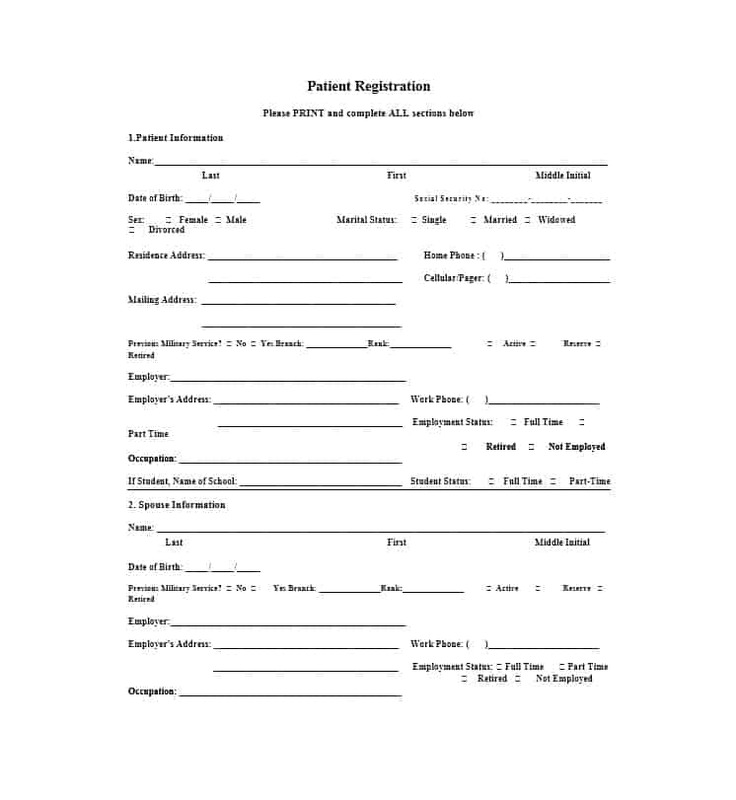 The information provided by the patient in the registration form can help the physicians/ surgeons a lot. 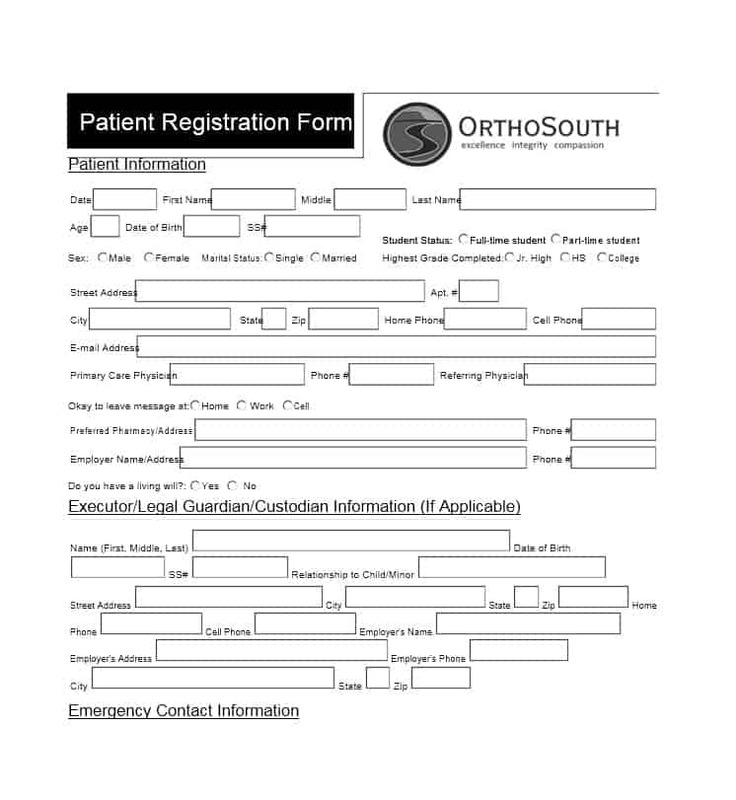 The information provided in the registration form reveals important things about the patient and his/her body. This information is extremely helpful in future procedures and follow up appointments. All of this allows the physician/ medical to take good care of the patient. 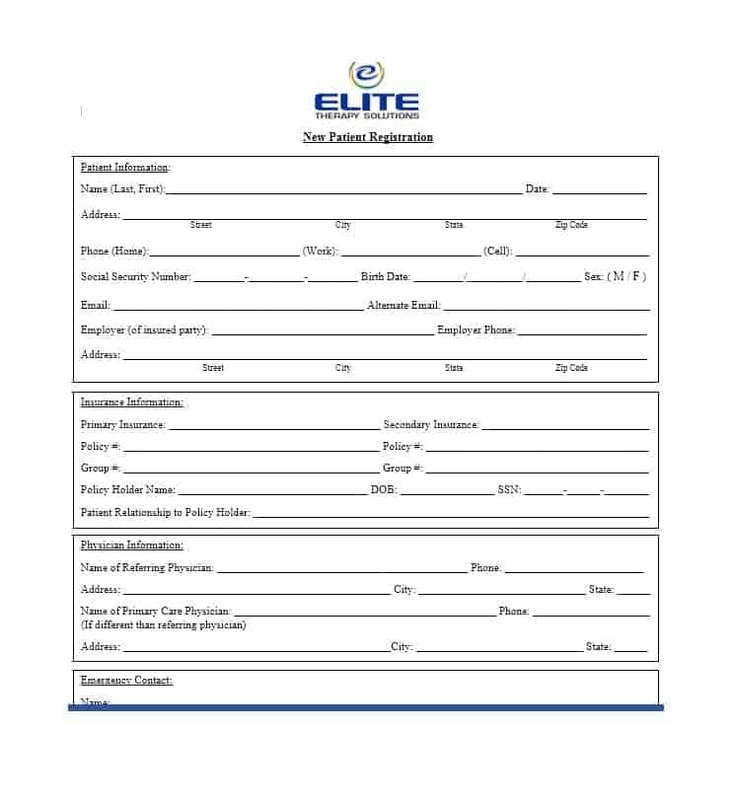 Before scheduling appointments, hospital/other medical care providers require patients to complete and sign a patient information form. Once the patient registration form is completed with all relevant information, a member of the medical staff reviews it. 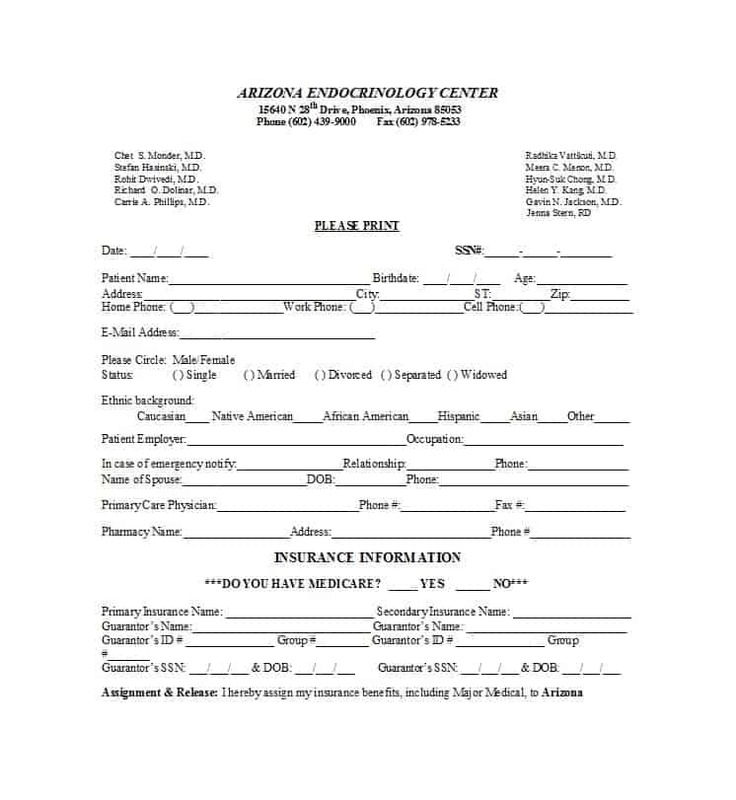 Once the medical staff member has checked the form for accuracy and completion, an appointment with the physician/medical care provider is scheduled. 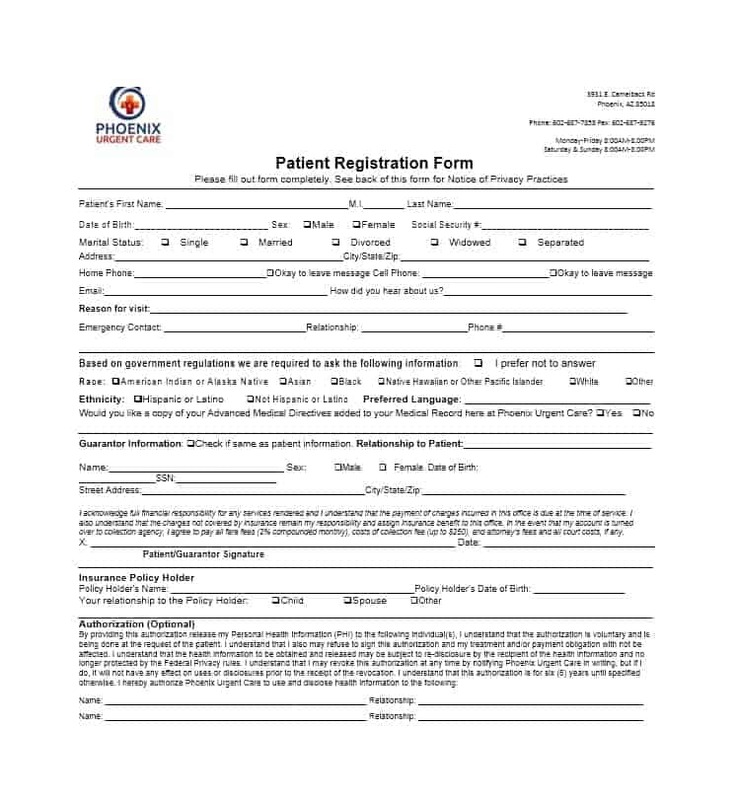 Completing and signing the new patient registration form is just the first step in the medical care or even the registration process. It is important for patients to update the information in the form each year or whenever a change in the information provided occurs. Nonetheless, patient registration is an important step in meeting your health care needs. 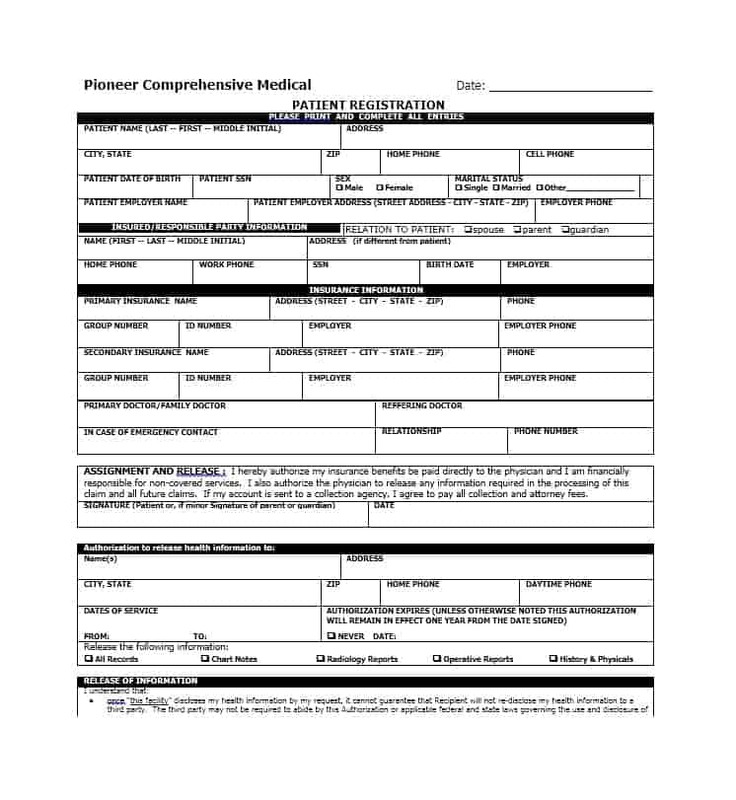 For many hospitals and clinics, drafting a patient registration form is not easy. 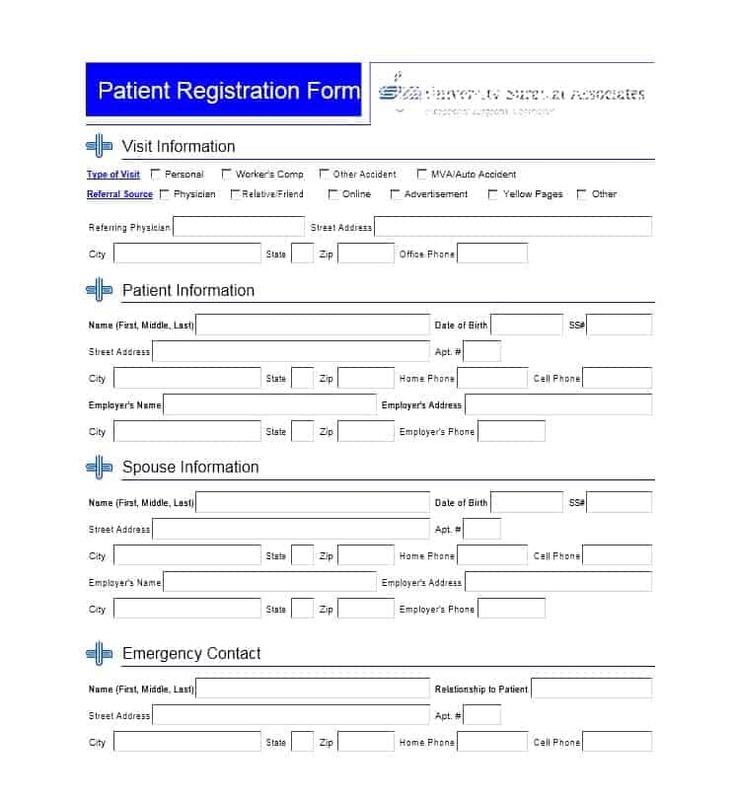 The good thing is that these hospitals/clinics can make the patient registration process easy for themselves and the patient by using a patient information form template. 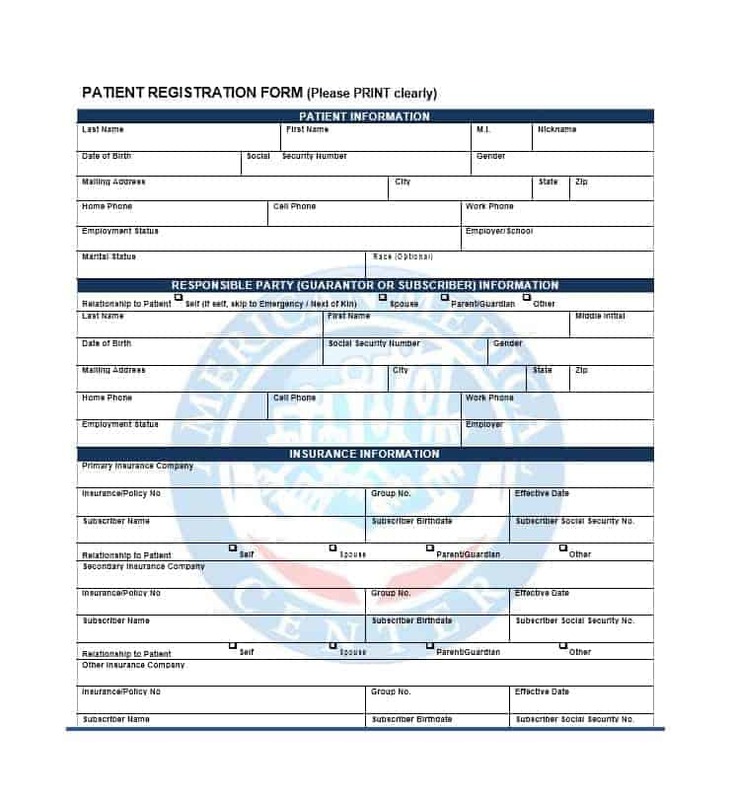 The patient information form template will reveal everything that the hospitals/clinics want to know about the registration form. 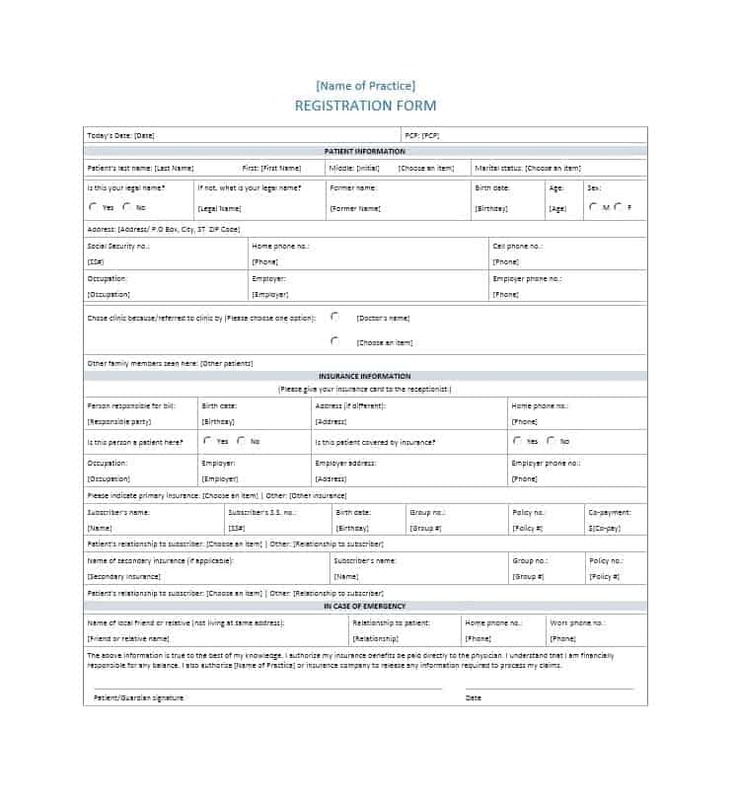 You can easily find the registration form template online. 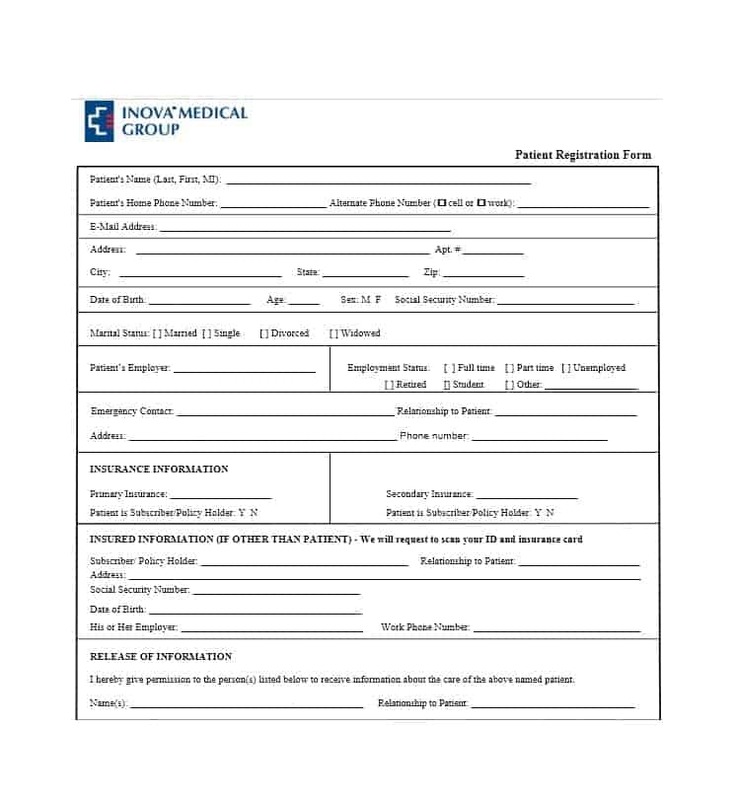 Other medical form templates available online include the medical consent form template, the medical history form template and the medication list form template. You’ll find all these templates extremely useful.